Once upon a time there was a baby hammerhead shark. He loved swishing his tail back-and-forth quickly to make bubbles. However, he never noticed how fast he ended up moving by doing this action. One day while swimming by his mom, he started playing his game. Swish-swish-swish, quickly with his tail. He didn't even notice how fast he left behind his family. Suddenly he was in open water by himself. The baby was left out in the open. For the first time in his life he was scared. Without his parents around to protect him how was he going to get home? He looked around in all directions and saw all sorts of sea creatures. Then a little fish swam up to him and said, "Hi, what are you doing? Your family is behind you. Turn around!" And, sure enough that is all the baby shark had to do! Your little one likes to squirm around just like the baby shark, and they can look just like him in the Toddler Hammerhead Shark Costume. The pullover knee-length tunic is the perfect way to show off swimming skills on land. Before wearing you must stuff the hammer head, tail, and fins with tissue paper before hand. 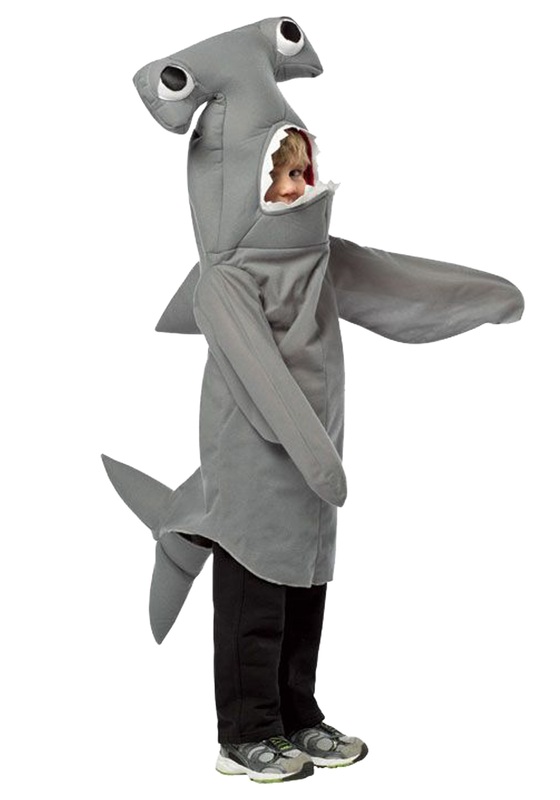 This costume is available in child and adult sizes as well. Go as a group to swim as a school on land, or let the little one be a big fish in a little pound.